In the context of UN reform the UN Secretary General calls for UN staff to develop the right skill sets, leadership, as well as coordination and accountability mechanisms to deliver on the 2030 Agenda. The UN Country Team Egypt and the UNSSC piloted a new collaborative leadership workshop for UN Country Teams in the UNSSC Knowledge Centre for Sustainable Development, Bonn. The case for repositioning the UN development system is compelling: the world has changed, the 2030 Agenda demands that we address today’s global challenges in a way that all people on this planet can thrive today and tomorrow, leaving no one behind and without overusing the earth’s resources. The UN system therefore needs to change the way it works, so that it can support countries better as they seek sustainable solutions for their people. UN entities should be more collaborative and less territorial, focusing much more on the collective difference they can make in the lives of people through the specific areas of expertise that they bring. They need to be better able to start from the 12,000 feet view to see the whole picture and understand where they fit in the sum of the parts, rather than approaching development challenges primarily through the lens of their mandate. With an impartial RC who does not speak for any one agency more than for another, means and capacities should be pooled to support national priorities more effectively. We all understand that there isn’t any other choice than to collaborate. The UN is a small player compared to so many other actors. ODA is a relatively small source compared to foreign direct investment, remittances, domestic sources of revenue or the amounts lost in tax evasion. At the same time, while the disincentives sometimes seem overpowering, the case for change is equally compelling. Governments increasingly seek policy advice on issues such as economic transformation, new approaches to data collection, foresight, as well as ways to achieve policy coherence across sectors and levels of government. In a world often driven by particular interests, the UN must defend “its norms and standards and their application without discrimination, fear, or favour” as the UN System Leadership Framework puts it so forcefully. The challenge for the UNCT and for me as the RC is therefore to build on the imperative for change, to focus on the opportunities it brings along and to invest in building a UNCT that can effectively support the Egyptian people as One. As a matter of fact, at the UNCT in Egypt we had already worked towards improving our response to the 2030 Agenda for the last few years. In 2015 the Government of Egypt approved the Sustainable Development Strategy: Egypt Vision 2030 (Vision 2030), and has since then submitted two (2016 and 2018) Voluntary National Reviews (VNRs) to the High-Level Political Forum on Sustainable Development in New York. The UNCT must therefore collectively support these commitments of the Egyptian people towards future generations. Based on discussions with UNCT colleagues, I decided to invest in accelerating our ability to collectively bring out the best from our agencies by spending some time to strengthen the “T” in UNCT and building a real TEAM. Together with the UNSSC Knowledge Centre for Sustainable Development we plotted a pilot Leadership Meeting for the UNCT and PMT Egypt in order to strengthen ties among the UNCT and PMT members, ensure a better understanding of the challenge and the opportunity at hand and define initial rules for engagement among ourselves. At the UNCT in Egypt, we have agreed to emphasise shared leadership in line with the UN System Leadership Framework. This means that we want to challenge each other—the leaders appointed by the UN agencies—in a direct way to take responsibility for our individual and collective contributions to joint UN success. We realise that as we transition from a modus operandi of cooperation and coordination to real collaboration and integrated development solutions, this will have various implications. Meanwhile, all UN offices in Egypt are already running at full speed at this moment to meet the demands of national priorities. Hence, we have decided, it is time for us collectively to think how our collaborative actions can make us run smarter and faster as One UN. Ultimately we want to agree on a leadership compact in which UN Country Team members will commit to certain deliverables for the UN system, with the support of the RC as an enabler and amplifier along with the wider Resident Coordinator’s Office (RCO). The leadership compact is constituted by the outcomes the UN Country Team will collaboratively achieve, while at the same time it lays out a set of tangible work plans for the RC and RCO. The focus of the UNSSC – UNCT Egypt Leadership Meeting was therefore on relationship building. The investment was focused on strengthening mutual trust and confidence, contributing to transitioning to our new modus operandi, with the result in mind, i.e. to have a real impact to achieve the 2030 Agenda and Egypt’s Vision 2030. The UNSSC designed a tailor-made programme for us, considering the different levels of experiences within the UNCT. Many of us have been in multiple facilitation environments and wanted to have an experience that would be new and energising. We also wanted to find innovative ways to unpack constructive team behaviour. Finally, it was clear that we needed to focus on experience-based learning, rather than lectures. In preparation for travelling to Bonn, UNCT members were tasked to submit a video blog, in which they reflected on their agency’s strategic approach to sustainable development and how this is reflected in their respective country strategies. Moreover, a reading list was circulated to enable colleagues to orient themselves on sustainable development thinking. A social learning platform was also made available for colleagues to access all documentation and interact with each other. The three-day Leadership Meeting combined substantive sessions recapping core notions of the agenda and the subsequent leadership behaviours required from UN staff with sessions allowing to address bottlenecks and opportunities. We honestly assessed where we stand as a team and I did share that for me to truly be empowered I need the support and buy-in of the UNCT. I also outlined specific challenges of being in the middle of the UN reform – a plethora of new guidelines that must be assimilated as well as the uncertainty of the availability of resources for coordination purposes. The instruction was essential to ground the team’s challenge: we must make progress on SDGs achievements, further align to sustainable development-driven national priorities, and find ways of assimilating this within our ongoing UNPDF. Moreover, the challenge of how to deliver integrated policy solutions to the Government, that is rapidly putting forth a new set of sustainable development issues, was placed on the table. - How do we raise the strategic level of our work? - How do we work with a Government still experimenting with sustainable development inter-ministerial coordination? - How much change can we assimilate within a short period, without compromising our operations? - How much have we invested in bringing our staff on board with the changes and UN reform? This last point is critical, as when staff are not sensitised, how much progress can we expect? Going forward, the meeting introduced tools on design thinking and partnership development to help the UNCT come to terms, not only with the fact that new challenges require new integrated solutions, but also that sustainable development will push us into new partnership relations with international financial institutions (IFIs) and the private sector. A more systematic exploration of solutions, innovations, co-creation with new partners, was a message that we well-received, not in the least as the tools introduced were pragmatic and could also be sourced in Egypt. The Leadership Meeting was not focused on trying to immediately generate solutions. Rather, it focused on identifying common perspectives that we as a team could unpack later, without feeling threatened by the change in new sustainable development-focused leadership behaviour. The most innovative and complex process of the Meeting related to challenging team behaviour. The UNSSC brought Ergo-Ego, a Norwegian team of actors and facilitators using forum theatre techniques. This approach helped us to examine our own behaviours and get us to talk about relational aspects, which would be difficult to address in a standard setting. The actors, who not only provided a “Gestalt” of the UNCT through a character called John, but also pinpointed conflicts and behavioural patterns through the fictitious but highly credible scenes, provided us with some eye opening moments. Among other take-aways, the scenes pointed everyone at their individual responsibility to manage the atmosphere and relationships within the team. When some participants wanted to slip into cynicism, the facilitators reminded us of our responsibility to exert leadership at all levels of the system with a “If not you, then who?” The Ergo Ego psychologist reminded us to stay reflective rather than reactive, focusing on what is in our zone of influence rather than the zone of concern. The scenes and discussions helped agencies to understand better their own behaviours within the team – explanations of teams as social constructs and the brain/neurological reactions to team setting and stress were helpful to discuss and provide a language to address issues such as competition, trust, leadership, behaviour and challenges, in an honest manner while trying to exercise self-control. The final stage of action-planning showed clearly that the team was internalising many of the messages. This process will now be deepened in the Leadership Compact discussions. The event effectively set up an experience and learning environment that will continue to resonate through all UNCT members in the future. It is not expected that all UNCT members will change their behaviour in a radical fashion, but they will be more aware of their individual (leadership) responsibility, having good tools and understanding to moderate themselves. We have also established a better team understanding about what will make us jointly successful—this is best articulated through what we now call Rania’s rule: first work on the relationship! Team meetings have immediately become much lighter and the difference between team members who joined the event and those who could not attend (two agency heads) has become immediately apparent. A lot of communication from different team members and a new practice of team moderation is emerging. How long we will be able to maintain this atmosphere is not clear, but the team is convinced that we need to treat each other in a much more social and open manner. The UNSSC did an excellent job in not only finding new ways of facilitation but also by bringing in new pertinent tools and keeping all elements of the meeting together in a coherent manner. 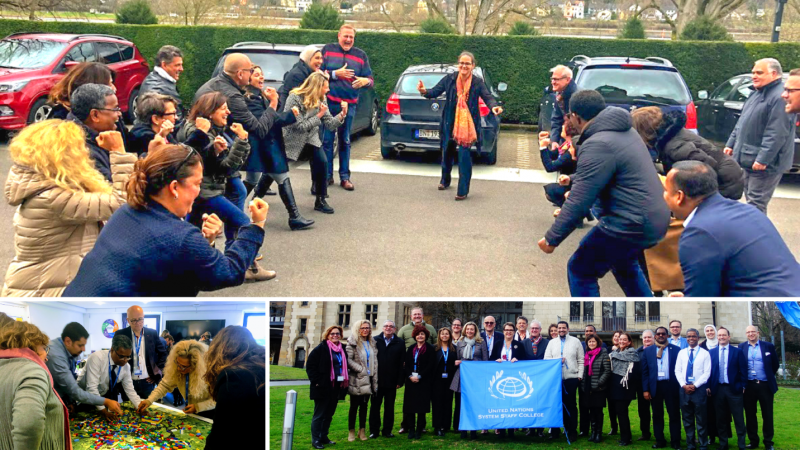 Participants remained engaged throughout and the atmosphere was well managed – which was also helped by the beautiful castle on the river Rhine where the UNSSC Knowledge Centre for Sustainable Development is located. Finally, we did not have the expectation to walk out of the meeting with concrete agreements. We had not set that as our benchmark. We were as a UNCT driven by the understanding that we as a social entirety of UN leaders were asked to do something new and complex together. We have come a long way in understanding our behaviours and our constraints. UNSSC offers UNCT Leadership Skills courses and tailored UNCT-oriented leadership and teambuilding learning offerings focused on shared leadership, systems thinking, and co-creation. UNSSC offers collaborative spaces for UNCT strategic retreats and teambuilding sessions. Learn more about our tailored programmes on the 2030 Agenda and repositioning the UN Development system by emailing us at sustainable-development@unssc.org.